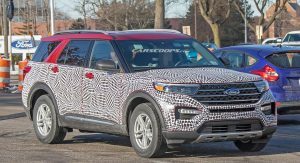 With the countdown already on for the reveal of the 2020 Explorer, we get our best look yet at the Blue Oval’s popular large SUV. We wouldn’t blame you if the overall silhouette fooled you into thinking that it’s only facelift, but it’s a truly new model. 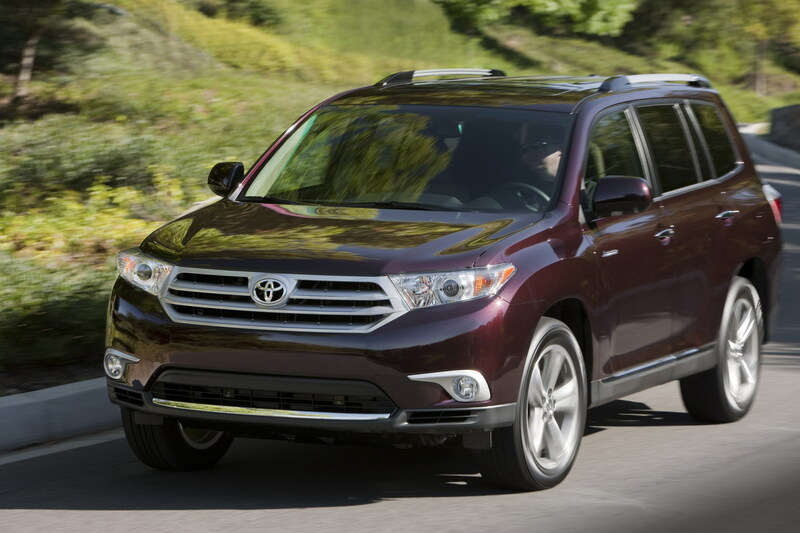 That’s mostly evident from the re-imagined front end, which bears a passing resemblance to an older version of one of its most prominent competitors, the (facelifted) 2011 Toyota Highlander. 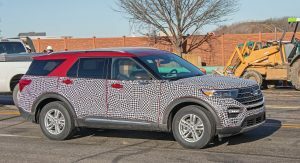 Beyond the face and the different proportions, which we’ll explain below, the next generation Explorer also gets a tighter greenhouse with a more aggressively sloped D-pillar, and more angular design elements for the rear, including the more compact three-dimensional taillights. 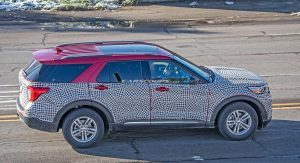 From what we can tell from a close up picture, the interior has been overhauled with a more angular design for the dashboard and other components such as the door handle surrounds. There also seems to be a large, semi-tablet style touchscreen that partially extends above the center console. Look for the latest version of Sync along Ford’s new suite of active safety features collectively named ‘Co-Pilot 360’ that debuted in the latest Edge and which include automatic emergency braking with pedestrian detection, blind spot warning, lane keeping system, reverse camera and automatic high beams. 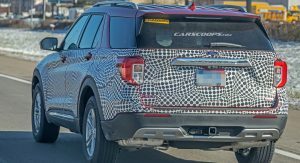 Per Ford’s own announcement on the 2020 Police Interceptor Utility hybrid, which is a renamed Explorer for cops, the three-row SUV will retain the same passenger volume as before at 118 cu.ft, but will have additional cargo capacity. Remember what we said about the new Explorer having different proportions? 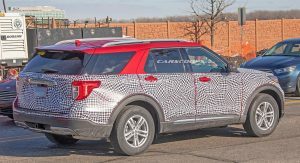 That’s due to the 2020 model switching to a rear-drive layout with a longitudinally mounted engine, which results in a modified dash-to-axle ratio and shorter overhangs. 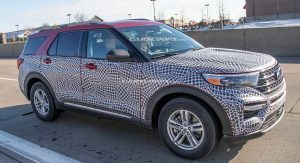 The new Explorer shares its CD6 platform with the also new 2019 Lincoln Aviator that will appear in production form at next week’s LA Auto Show. 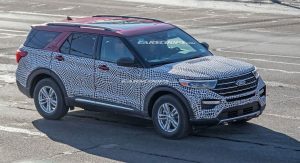 To be offered in both rear- and all-wheel drive iterations, powertrain options are believed to include a 2.3-litre turbo four, a 3.3-litre V6, 3.3-litre V6 hybrid and an Ecoboost 3.0-litre V6, paired to a new 10sp automatic transmission. 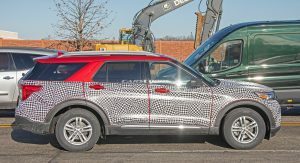 The turbocharged 3.0-litre Explorer ST variant, should deliver around 400 hp (298 kW). 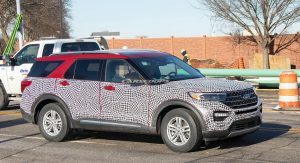 There’s no lack of rivals in this segment, with the Ford Explorer to go against GM’s Chevrolet Traverse and Buick Enclave, Dodge Durango, the Toyota Highlander, Mazda CX-9, the Volkswagen Atlas and Subaru Ascent. 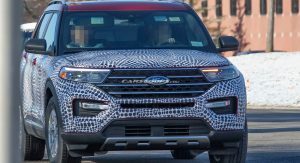 The 2020 Explorer will go on sale in the first half of next year, though we still don’t know if Ford plans to introduce it at next week’s Los Angeles Auto Show or if it will prefer to wait for the Detroit Motor Show in mid-January. It’s looks alright, not earth shattering, but alright. 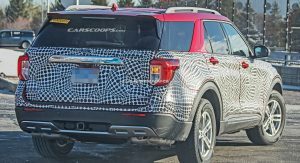 I think it will be release at Detroit Auto Show! 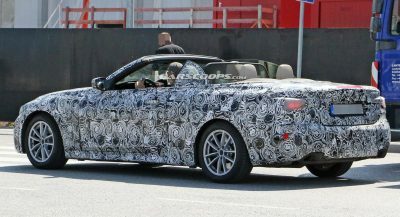 Looks nice from what I see of it which is only the roof line and front grill. How the f- do you mess up the front end of an Explorer? This is awful and boring. Agreed! They completely f-ed this one up! I am liking the current one more.. just a little disappointed here.. but I don’t see the Highlander thing. Not sure about this. 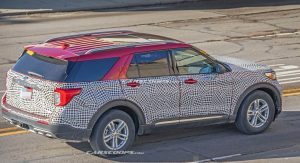 But I will say this looks good for the production Lincoln Aviator, same platform and should be around the same stance. I see VW in the front with the way the lights interject into the grille. Not their best design. Yep, T-Roc and T-Cross face! The 2013 Explorer Sport still stands as my favorite gen and model. I remember how different the Explorer looked than the competition and I found it attractive. Then the current model and now this one have gone more generic and copying other brands designs (such as the Land Rover). Looks like one of those Chinese copycat cars, except it’s not. 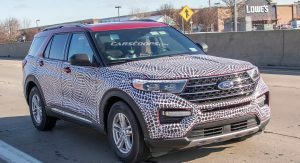 If this is the all-new, Ford Explorer then it looks more evolutionary, and it also looks like a bigger Edge, stylistically. Except for the fact that the Explorer easily outsells them both. Used to look like a Range Rover… So better or worst? Wow ..it already looks like it needs to be replaced. it looks really bad, not gonna lie. I’m a bit disappointed. 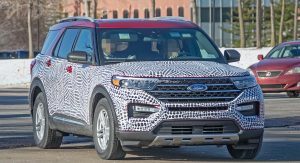 The 2020 Ford Explorer looks big and bold. It looks like a truck and SUV combination. I’m kinda getting use to the front look. those head lights makes it looks a little bit goofy to me. 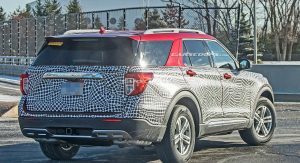 This may just be my theory, but I think Ford is really putting a lot of effort into making Lincoln it’s own luxury brand. So much so that I personally think they designed and developed the upcoming Aviator which looks absolutely beautiful in the pre-production preview they showed to us a number few months ago year. I think that they are so forced on Lincoln that instead or retrofitting fords to be Lincolns, I think it’s the other way around now. 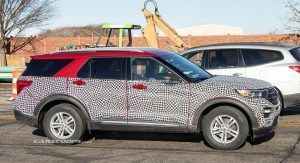 Because it looks as though the took the chassis of the aviator, removed the interior, stripped away all of the sheet metal, and then tried to build and explorer from it (hence why everything looks so ‘tacked on’ with this new Explorer). 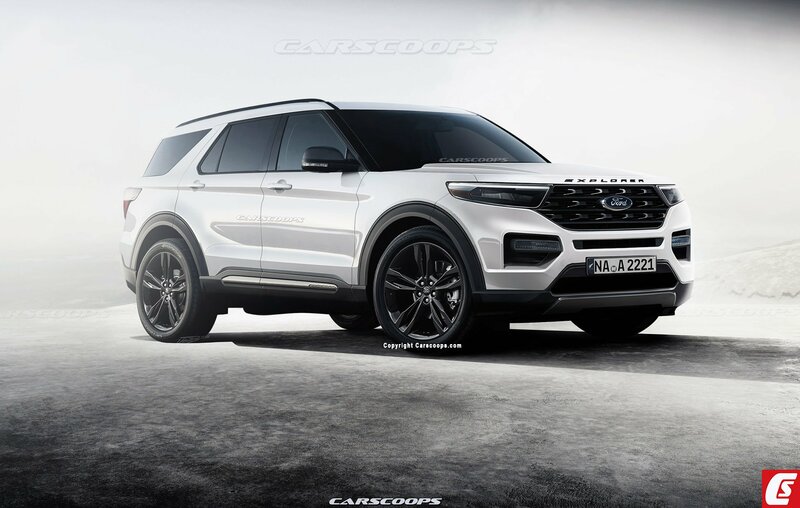 It may just be me, but I think that why the roof line isn’t properly aligned with the body, why the rear tail of the vehicle & the ‘LR-like’ ‘Explorer fin’ looks like it was slapped on, and lastly why the headlights look so out of place. I loved the way you’ve put all your ideas together, and i can’t agree more with you. thank you for that. It totally makes sense to me. You don’t really understand how vehicles are engineered and designed. Car companies don’t take one car and then strip it away to make another car. When dealing with platform sharing the vehicle teams start with that platform and build from there. Your feelings about the design not withstanding, there is nothing “tacked on”. Well I actually kind of do have experience with automotive management, and vehicle design/engineering, but I won’t get into my the personal aspects of my life here. Anyways, you are right. Generally automakers tend to share vehicles on the same platform. 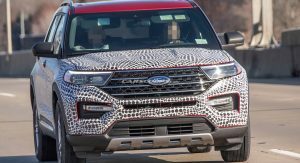 But there are few cases where automakers (and ford actually used to do this during the 2000’s which is why I had previously brought up Lincoln, ) will simply change the sheetmetal, body panels, and interior of a vehicle (without changing the chassis itself). It’s different (if not more) than simply sharing a platform. For instance, (& funt-fact) The “LandRover RangeRover Evoque” & the “Lincoln MKC” both share the same platform, yet they are 2 different vehicles. But if you take a look at many Ford & Lincoln products from the early 2000’s they share much more than the platform as I was suggesting. 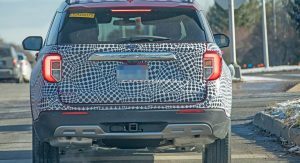 This is something you can see on most Lincoln vehicles prior to 2012/2013, and In fact this is something ford addressed back in 2011/2012, and stated they would be changing (post 2013) as they have . Most of Lincoln vehicles today (i.e the; Continental, MKZ, MKC, MKX) simply share a platform with other vehicles, and are (apart from platforms, and at times powertrains,) separate and individual vehicles (current generation Navigator Aside). When you share more than just a platform, you will have to account for the placement of wiring, and other internal vehicle systems. It is very clear that the Aviator & Expedition do share more than the platform alone. 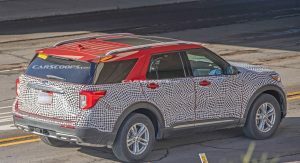 But I was suggesting that opposed to Lincoln having to change a ford based vehicle to fit their line up, instead Ford is the one who is changing their vehicle, hence why (and if you take a closer look at the images) things don’t align properly, and again, things look and feel “tacked on” and/or Out-of-place. But if you have a different opinion than that is ok. 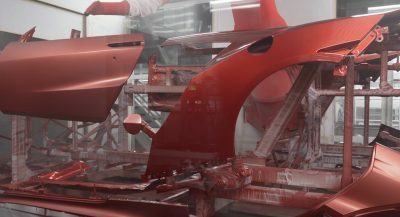 I personally did not feel the need to point all of ^^“this”^^ (all of the above) out in my original comment as I presumed (for anyone who has worked with, and studied on, vehicle design/engineering in the past,. or even for those who may have not) was just common (or at least relatively known) knowledge. Anyways I was simply presenting (in my previous comment) my theory on the situation. I hope this bit of information and explanation helps to clear things up. All the best ~ Mike. (lol) No worries. If I weren’t me I would probably consider it TLTR too. I have no idea why Ford decided to keep the basic look the same. The switch to RWD is questionable, if you ask me. Do the cops (that prefer RWD) really have that much clout in the design of a vehicle? Apparently they do as all the teasers of the Explorer were police vehicles. 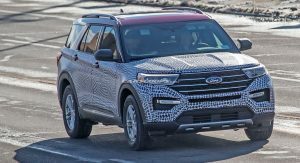 I feel like Ford was primarily making this Explorer as a service vehicle and the leftovers can be sold to the public. 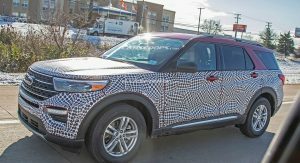 The sales for the Explorer have either increased or stayed consistent for the past 3-4 years. I’m not surprised they didn’t change it much on the outside. 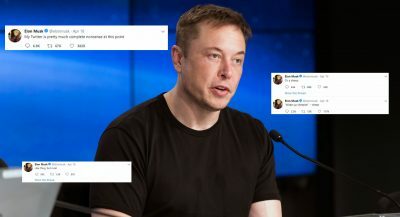 Why mess with success in this case? 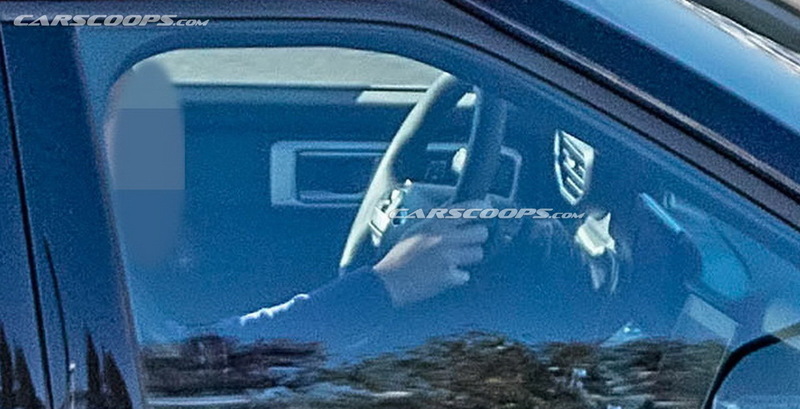 I dislike the front of the Explorer, way too similar to the Toyota Land Cruiser. I HATE that front grille and headlights! Together it looks ssooo cheap looking. 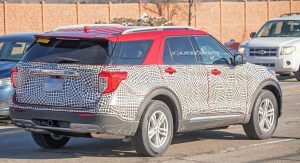 It’s too bad really because I know Ford can do better but they just won’t because they are so afraid of stealing sales away from Lincoln. 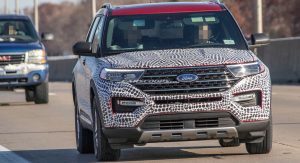 I’m sure it will have a nice interior and some really good mechanicals underneath but to me, the exterior (front headlights, grille, tail lights and almost the same profile), as a whole, is a big nuthin’. I was seriously was considering this vehicle, but if Ford wants me to put money down for this, it’s gotta look better. It will probably sell well anyway though. 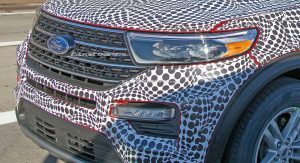 The horizontal stripes on the grille are terrible. The concept rendering looks much better. I have a feeling the ST version will have a grille somewhat similar to the concept render…..maybe.